10 Best Franchise has released the following winners of its new Top Franchise Opportunities Award: H&R Block, Hardee's and Circle K. These successful chains provide great products and make those they hire feel empowered as business owners. Recently, 10 Best Franchise announced the development of a new award category: Best Franchise Opportunities. For the month of July, 10 Best Franchise chose H&R Block, along with several other firms as the top contenders. The new award acknowledges organizations that excel in providing prospective business owners with excellent franchise opportunities that can take their economic growth and vocational capacities to a new level. H&R Block was recognized as one of the best franchise opportunities because it empowers businesses and individuals by quickly and correctly filing their returns as the new year begins. Additionally, the professionals of H&R Block excel in helping individuals who wish to have their tax records monitored and optimized each quarter. The company's representatives are pleased to provide support and assistance for individuals who are interested in owning a franchise. Set up is easy at almost every location. Individuals interested in developing a franchise should possess some knowledge of today's tax laws and codes. H&R Block does provide training to facilitate the knowledge acquisition process. Hardee's is another leading franchise for the 2016 year. As a best franchise, Hardee’s is well known for serving made-to-order food that leaves customers full and satisfied. From chicken tenders to hamburgers, the restaurant chain provides clients with a wide range of foods to select from. Moreover, food service is delivered in an amicable environment that will make patrons feel like they are at home. Additionally, Hardee's is pleased to continually update its menu so clients are always able to select from exciting new food items. Those who are interested in franchise opportunities will attain support from Hardee's representatives. The company has a business plan in place as well as finished products which can be delivered to every restaurant. This helps ensure that franchise owners find it easy to operate their business. Circle K is an impressive store chain that provides clients with a wide range of items, including groceries and toiletries. A nationally-recognized top franchise, Circle K represents a viable option for individuals interested in exploring franchise opportunities. Each store's message is consistent and vendor relationships are already established. These factors help optimize expense and advertising money so that it is utilized in the best way possible. Those who wish to pursue a franchise should know that doing so can enable them to be self-employed. 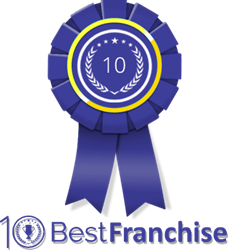 For more information about the award winners, please visit http://www.10bestfranchise.com.